ZMR pumps are foresen with single mechanical seals, lubricated by the pumped liquid or with double mechanical seals flushed with liquid of externchemically compatible to the liquid pumped of external supply. With casings and impeller made of of GFR PP (Glss fiber reinforced polypropylene) or CFF E-CTFE (carbon Fibre Filled Ethylene Ethylene CloroTrifluoro ) virtually all chemicals, to low and medium temperature, can be pumped. The different combinations of sliding counterfaces material available of the mechanical seals, allow to pump liquids laden with suspended solids or abrasive. 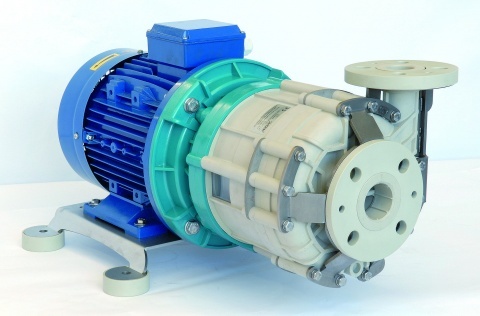 Electricl motors aarted with three different power steps : “N” standard, “P” enhanced or “S” super enhanced, allow to pump, even at full capacity, liquids of incresing specific weight (1,05 – 1,35 – 1,8).